During this 36th episode of Style of Business (SOB), Keetria interviews Denise Dantzler, the co-founder of Joshy’s Soap Bars, a natural soap company for kids from Baltimore, Maryland with her son Joshua Dantzler—who is only six years old. 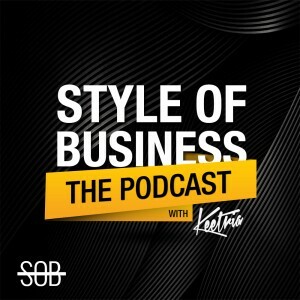 During this 36th episode of Style of Business (SOB), Keetria interviews Denise Dantzler, the co-founder of Joshy’s Soap Bars, a natural soap company for kids from Baltimore, Maryland with her son Joshua Dantzler—who is only six years old. They discuss the inspiration for the company, how they go about designing the soaps, and how this mother and son team learned to start their own business. Josh has very sensitive skin, and didn’t like the smell of the soap he was able to safely use. Josh decided he was going to make soap and start a business. Denise really dug in and researched how to make natural homemade soap. Joshy’s Soap bars come scented and unscented, in fun animal shapes and colors. Denise talked to other soap makers, went to many organic stores, trade groups, and took classes, along with her own research to get their product to market. Learning the business side was one of the main obstacles. Listening to customer feedback helped them phase out products that they personally loved. Josh and Denise brainstorm and draw their ideas with colored pencils. They also buy molds and create their own molds. Josh is very inspired by his grandparents, who work with their hands and are entrepreneurs, along with his uncle who is also an entrepreneur. Josh and Denise attended the Baltimore Business Fair for kids and the Washington DC event as well. Computer programing, basketball, Pokémon, and Legos are Josh’s interests. A portion of the proceeds of Joshy’s Soap Bars are going to the University of Maryland’s Children’s Hospital. Josh was born prematurely small and has accomplished many things that doctors said he would never be able to do. Joshy’s Soap bars began because Josh has very sensitive skin and didn’t like the available soap he had to use. Love what you do and seek out a support network. – “Right now we are selling online. We have a website JoshysSoapBars.com. We also sell through Instagram and Etsy, and in person.” – Denise Dantzler. – “Just because you were born small doesn’t mean you can’t do big things.” – Joshua Dantzler. – “Whatever you start your business in, make sure you absolutely love it and that you are passionate about it. Because that becomes like your second child.” – Denise Dantzler. Children’s Business Fair – Website for Children’s Business League.